As fall gives way to winter and temperatures slide, you must prepare your chicken coop to give your flock the best possible chance at surviving the winter. By looking over the coop in autumn and making any necessary alterations, the long and potentially harsh winter will be much more bearable. Clean the coop thoroughly before cold sets in, when your chickens are outside. Remove the feeder, waterer, nest boxes, roosts and any other removeable fixtures to clean and dry the space. Use a water hose, and scrub the coop surfaces with a vinegar-and-water solution. If the coop is located out in the open or in the middle of your land, consider moving it close to a structure, such as a fence, an outbuilding or your home, that can serve as a windbreak. Visually inspect the coop and feel for any drafts while it is empty. Check for any needed repairs such as loose boards, nails sticking out, doors or windows off track, and cracks or holes that need sealing. The roof, especially, must be water-tight. Look for signs of pests such as bugs or rats; they not only make their own entrances but can spread diseases to your chickens. Secure the fencing that it is buried at least 6 to 12 inches underground; this will thwart digging predators looking for easy meals. You may be tempted to close up the entire coop, but ventilation is necessary throughout the winter to prevent buildup of toxic ammonia. Reduce ventilation by closing up any windows or vents that would cause drafts. Leave a few vents along the roof or some floorboards open. Check that the humidity level stays between 40 percent and 60 percent. 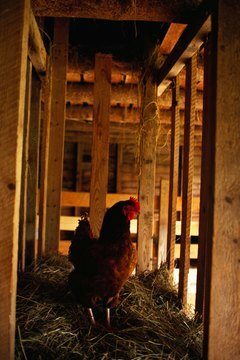 Insulation within the coop walls and roof help to keep in any heat generated by the chickens, litter or heat lamps. Place it between the coop walls and pieces of drywall or plywood so the chickens cannot access and peck at it. Install a layer of wind sheeting, such as plastic, on the inside and outside of coop, and poke holes in it to maintain proper ventilation. Lay a thick layer of litter, pine shavings and hay, about 4 inches deep. Continue to add it weekly as you remove old waste until it reaches a depth of 10 to 12 inches. This method generates heat in the coop. You may top off the substrate occasionally, but replacing the litter entirely will wait until spring. You can use the old litter as compost. With electricity-free measures in place, most chickens will adapt to winter's decreased temperatures. However, floor or hanging heat lamps and light bulbs are an option. Instead of carrying fresh, warm water out to the coop throughout the day, as access to unfrozen water is necessary, consider a running water fountain or heated water bowls. These require electricity running to the coop, which has the risk of becoming a potential fire hazard. Furthermore, chickens will be less prepared for severe cold if the power goes out. If you choose to do wire your coop, look over the cords, electrical outlets and the heating devices themselves to ensure everything is in working order. Should a power outage occur during extremely cold, harsh conditions, you will need to take your chickens inside until the weather lets up.